The Three Stooges find themselves in the office of the Canvas Back Duck Hunting Club in a successful attempt of evading the police after stealing a watermelon and promptly land jobs as salesmen for the club. Unbeknownst to the boys, they’re selling phoney memberships and sell them all to the police, mayor and even to the governor. Everything is going just fine later at the club until a passerby informs the group that "there hasn’t been a wild duck around here in years!" 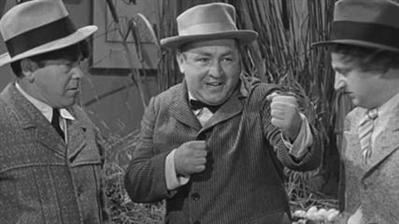 Leave it to the Stooges to improvise; Moe and Larry keep the hunters occupied with rubber dummy ducks while Curly rounds up a group of live ducks which are promptly blasted to smithereens by the eager hunters. Everything is going just fine (again), with the boys themselves participating in the hunt until the owner of the “prized” ducks appears accusing the Stooges of stealing, it’s then the boys turn to get blasted to smithereens by the unhappy hunters. I love this short, lots of gags, Curly’s battle with the duck kills me every time. "I'm telling you man. Who is on first." I remember seeing this episode when I was really little, and it still makes me laugh. Yeah, that scene is classic. I love when Curly becomes the 'Pied Piper' of ducks. "So let me get this straight...you ran naked around an office building for an hour, beating people with a coffee pot?"